Once upon a time, long, long ago, back when the Internet was just born in 2001, I got married. Married life wasn't always easy, though. I, personally, had a difficult time because I tried so hard to make him happy - but I was doing what I thought would make him happy, not what actually would. I went around making up "points" about what makes a good marriage, and ended up feeling like a zero. What changed for me was when I stopped to really examine my relationship with my husband based on what matters to both of us. 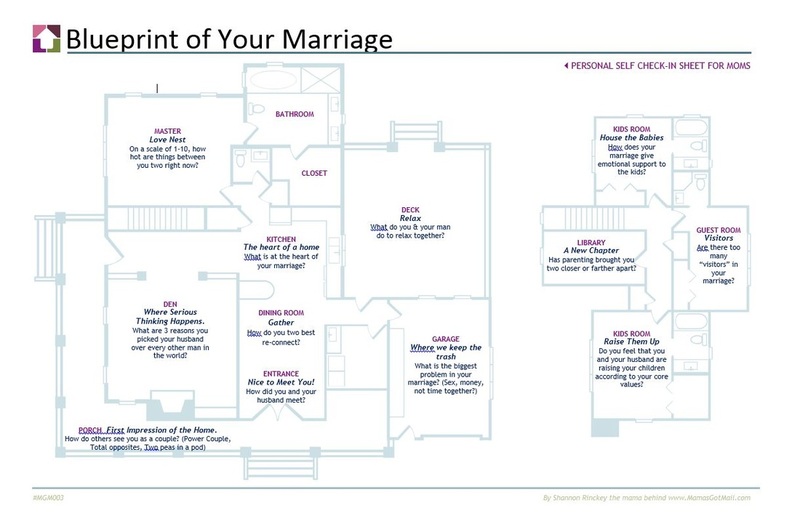 I created this Blueprint of Your Marriage as a way to visually take an inventory of your relationship with your man. Feel free to download this Blueprint of Your Marriage tool (see link below) to do a quick check-up on your marriage, too! Remember, you and your husband are the architects of your family, and it’s important to keep that relationship alive and healthy based on what really matters in marriage. May you have many years laughing and smooching together!